We service and repair all types of Centrifugal Pumps including Vertical Turbine, Horizontal Splitcase, Multi-stage, API, ANSI, Mag-Drive, Submersible, reciprocating, and others. 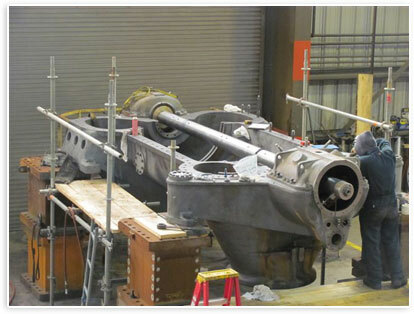 We perform impeller repair and balancing, shaft repairs and straightening, shaft coating and grinding, case and impeller wear ring replacement, all bearing and or bushing replacements, case repairs and machining services. Complete workscope details and repairs are cataloged.